Happy Friday, y’all! It has been a rainy week this week so we’ve been cooped up. I’m hoping to finally get out today and get some things done! The kids head back to school on Monday so we are going to meet their teachers and see their new classrooms this morning! Jacob’s teacher for his second grade year is actually one of my good friends from high school and she asked me to be the room mom this year and I’m really excited that she asked! I’m even more excited that I was able to accept! I would have never been able to do that when I worked full time because my work schedule wouldn’t have allowed it. Room moms these days are responsible for a LOT and it would have been entirely too much on my plate. Olivia’s teacher for her Pre-K 4 school year is the wife of a guy who I graduated high school with, so we already know their family as well. Olivia is thrilled to finally be moving over to Jacob’s school and I’m thrilled to finally have them both together again. I’m optimistic that it’s going to be a wonderful year! I finally got around to reading The Royal We these last couple of weeks and it was probably my favorite book I read all summer!! The first few chapters were a bit slow in my opinion, and I even got to the point where I thought I might throw in the towel, but I am so glad that I didn’t because I ended up LOVING it. 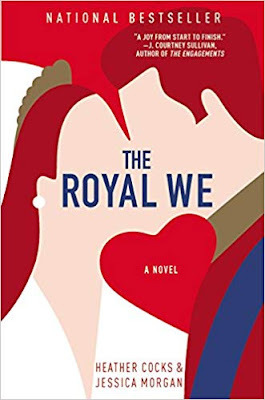 I have always been very fascinated with the royal family and even though this book is fiction, it is very loosely based on Will and Kate’s relationship. It made me laugh and it made me cry and now I’m yearning for a sequel! The characters were just so lovable and I wasn’t ready to give them up just yet when I finished the book. I did a little bit of searching online to see if there are any plans for a sequel, and while I couldn’t find anything about that, I did find out that they are turning the book into a movie! And Lauren Graham and Mae Whitman are producing it!! Maybe this is old news to you, but it’s new to me and I’m just thrilled! Anyway, if you’re looking for a light summer read, do check this one out. I borrowed my copy from the library, but I loved it so much I’m buying a copy from Amazon to keep because I’m already ready to read it again. As I said earlier, we’ve been cooped up this week due to loads and loads of rain, so we’ve been doing a lot of reading, movie-watching, and game-playing. Jacob got the board game Sorry for his birthday and I had forgotten how much fun it is! I swear, this week we have played it about ten times! It states that it’s for ages six and up, but Olivia (who is four) pretty much has the hang of now, too. She doesn’t understand the strategy fully yet, but she is picking it up very quickly. Anyway, if you’re looking for a game for the whole family to enjoy, this one is great! And it’s less than $9! These final two items in today’s post were also in my What I Wore post on Wednesday, so if you read that post, just skip the rest of the post and have a great weekend! Haha. 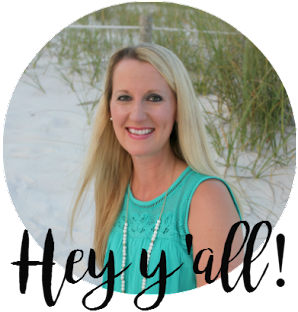 If you didn’t read my post on Wednesday, then these last two items are for you! I wore this scalloped cami for a date night a couple of weeks ago and the response I got from it was overwhelming. SO many people asked where they could get their hands on one, so I thought I would link it one more time. It comes in lots of colors and it is truly flattering. I wouldn’t mind having it in a couple more colors. And finally, the Nordstrom sale ends this Sunday and prices go back up on Monday, so I thought I would share my three favorite picks from the sale one final time. My very favorite pick is the Blouson Sleeve Cozy Fleece Pullover. The stitching around the collar and the blousy sleeves make for such a dreamy piece, and I could not be more happy with the color I chose – Pink Smoke. This would be the perfect top for a wintery date night. It’s soft and cozy and warm while also being classy and sophisticated. I will tell you this, though. This top runs large so size down! 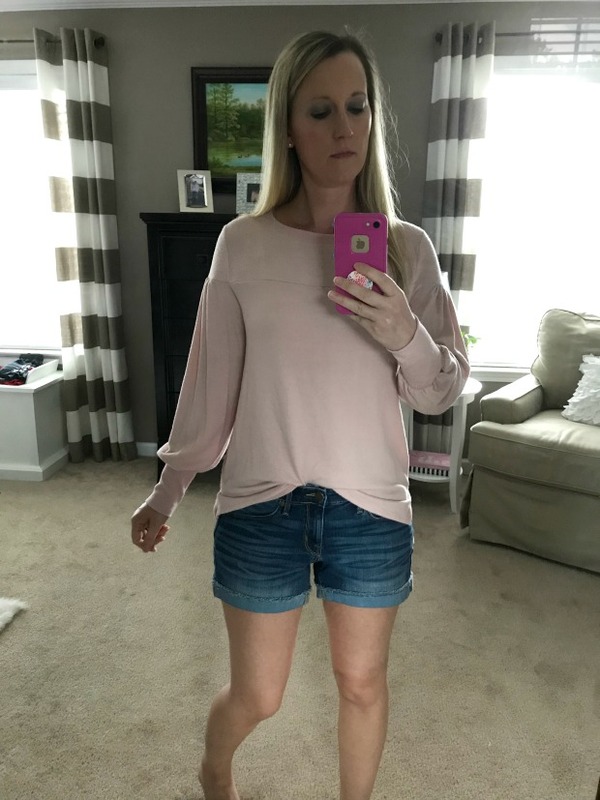 I typically wear a small in tops when I shop at Nordstrom, but I am wearing the XS here. I had actually ordered the small, but then read that it ran large, so I went ahead and ordered the XS, too, so I could try them both! I could definitely have gotten away with keeping the small if I had needed to, but the XS looked a bit more polished and form-fitting so I’m going to keep that one. 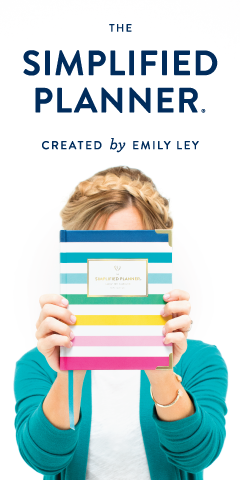 If you’re not into blush pink, it also comes in black, blue, grey, fushia, and grey and white stripes. There are still lots of colors left in most of the sizes, too! If I had a money tree I would buy it in every single color. I kid you not! My second favorite item was the Halogen Bell Sleeve Knit Top. I know I have already mentioned it once in this previous post, but it’s worth mentioning again because it feels like butter and fits like a glove. It comes in black, black and white stripes, and Kelly green and it also happens to be the most affordable piece that I chose. It’s still available in all colors and sizes! My third and final item that I ordered from the sale was this Caslon Tie Knot Sweatshirt. So, this top sold out in most of the colors and sizes almost immediately when the sale started. Since I wasn’t able to get the size/color combination that I thought I needed, I decided to go ahead and grab the color that I wanted in the only size they had available at the time – a large – so I could get it with the sale price. I figured that I could just exchange it when they get more in stock after the sale is over, and I would already be locked in at the sale price. Smart, huh? Well, when the large arrived I expected it to swallow me whole since I typically wear a small, but y’all, this top actually runs small and I think I like the way the large looks on me! The picture here doesn’t do it justice at all (and the smudges on the mirror also don’t help) because it is just adorable on! And so comfy! 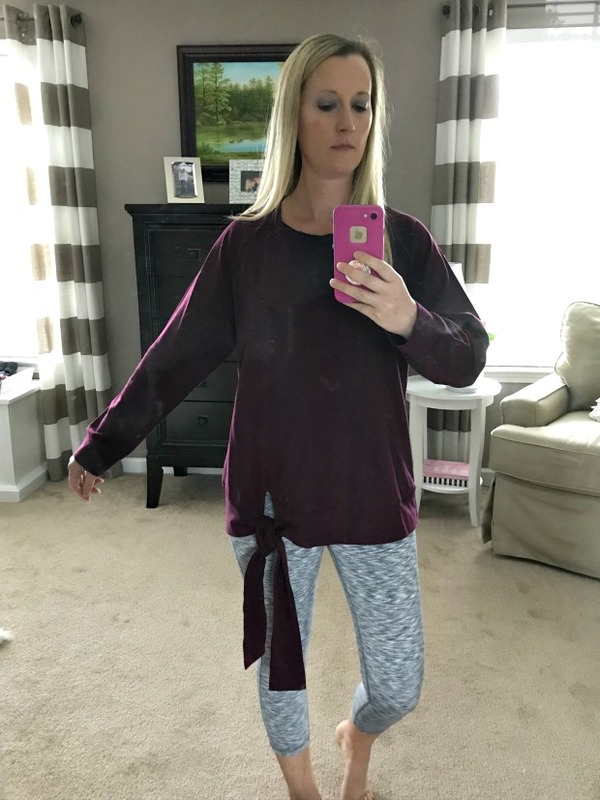 I bought this to wear with leggings before and after workouts so I may just hang on to the large because I like for my tops to cover my hiney when I wear leggings. What do y’all think? Go smaller or keep? Happy Friday, y’all!! Enjoy your weekends! CUTE Cami!! Have fun meeting the teachers! I always loved doing that! Eek! So excited for you getting to be the room mom. You will be perfect for the job! I read The Royal We a few summers ago and it's still one of my faves! I let someone borrow my copy and now it's gone (wah) but I think about re-buying it all the time so I can read it again and again! Have a great weekend, girl! You are going to be the BEST room mom - SO excited for you!!! I know being able to actually do something like this means so much. And I already told you this, but I love Sorry, too. We actually played it over Easter at my parents and it was just as fun as years ago - a classic. Hope meet the teacher goes well this morning! I will have to check out that book, I love the royal family as well:P Totally one of those people that woke up early to watch Harry & Meghan. Love your tops, I'm needing some new ones for work! Definitely check it out! If you love the royal family, you'll love the book! I tried The Royal We last summer and I did throw in the towel. I just couldn't get into it. Maybe I need to push through. That cami is so cute! That'll be so fun being a room mom! Y'all go back so early though! I thought we went back early here, August 20, because when I was in school in MN we didn't go back until after Labor Day! That's great that you'll be room mom! I was room mom when Zachary was in 3rd grade and now Simon will be in 3rd grade so I almost feel like I should be again! But his class does things differently and everyone just volunteers for different things they need done. Wahoo room mom. You will rock it. I may just have to get the book for our beach trip. I love that cami, such a great staple! I want that puff sleeve top but they are totally out of smalls, darnit! That is going to be so fun being room mom! And knowing the teachers is awesome. have a great weekend! Isn't it?! I loved it! I love that scalloped shirt. Is it thick enough to wear without a bra? I haven't played Sorry in years. Have a great weekend! Yay for being the room mom! Hope this weekend brings you some sunshine! We could use some rain here in Texas, so send it my way!! All this back to school business makes me so sad. I’m not ready to let go of these sweet summer days. How cool that you know the kids teachers and get to be room mom. So fun! That cami really is adorable on you. Love the scalloped detail. Have a great weekend! I always loved when my boys were all in the same school and on the same schedule (though I think that only happened one year!). I'll have to add that book to my list. I love reading about the royal family also. It is soooo nice!! Hopefully our kids should be at one school for the same times until they graduate!! I'm so glad you like The Royal We!!! Have you read The Selection Series? You would LOVE that!! You should read My Oxford Year by Julia Whelan next. It’s a wonderful book and a neat love story. It’s my favorite so far this year! You are the second person to tell me that! 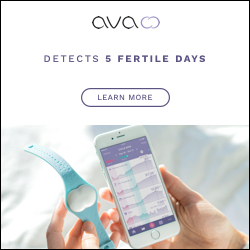 I just added it to my wish list!